The TI-501 is still the synonym of a very cheap basic calculator. Selling price in the year 2001 was about US$ 3. 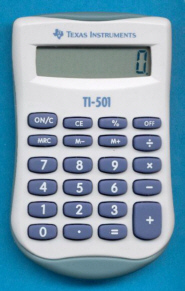 If you search a somewhat larger calculator you would find it with the TI-503SV. We recently discovered that an identical calculator was sold in Europe as TI-501SV.